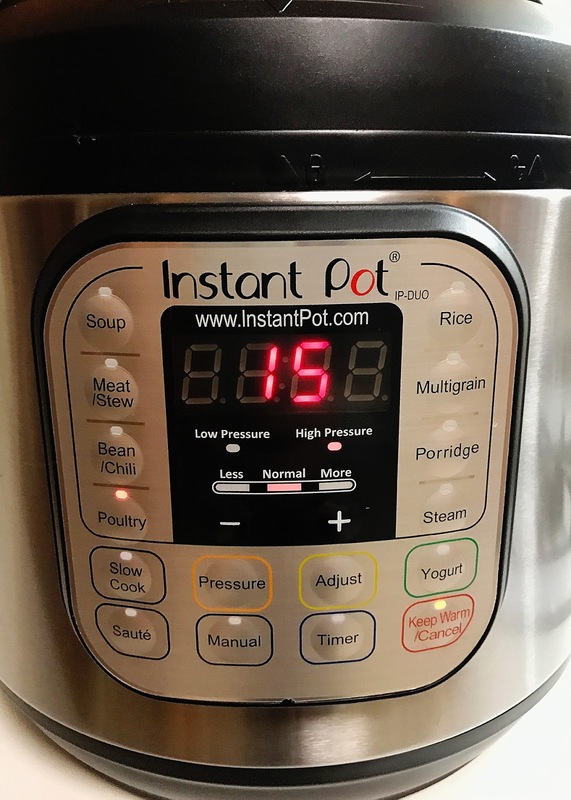 Will the wonders of the Instant Pot never cease? So here's a scenario: You've been busy all day, and suddenly it's 5 o'clock! Did you plan something for dinner? Well of course you didn't, it's been a crazy day! Is there going to be other humans depending on you to whip something up regardless? Why yes, yes there is. Enter the Instant Pot. 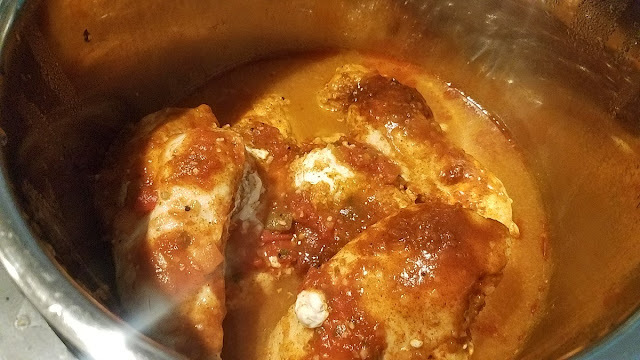 It will take FROZEN Costco chicken breasts and turn them into a meal in 15+minutes. That's right, you heard me. 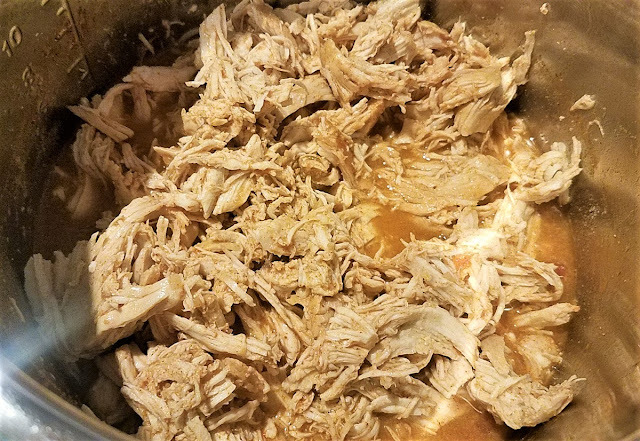 Once again defying the laws of cooking physics, the Instant Pot will save the day. 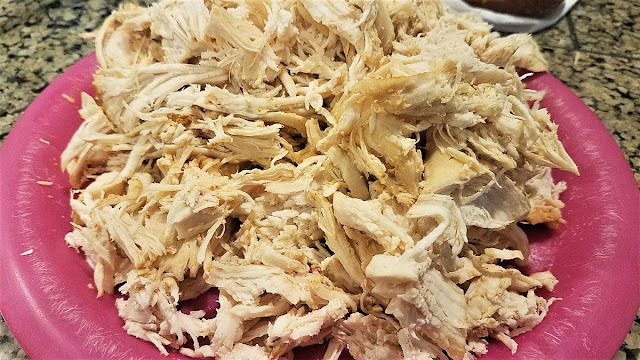 The Instant pot: Cooking frozen chicken and saving one dinner at a time. It's super easy. Plunk down the frozen breasts into the bottom of the pot. The "clang" the frozen chicken hits the pot is somewhat unsettling, but oh the payoff in a few short minutes! 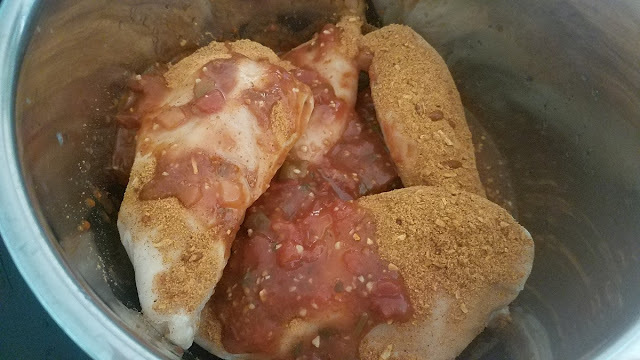 Dump over the salsa, water, taco seasoning, and salt and pepper. Seal the lid and plug in the machine. Hit the "Poultry" setting which will give you a default time of 15 min on high pressure. Let the pot do it's thang. 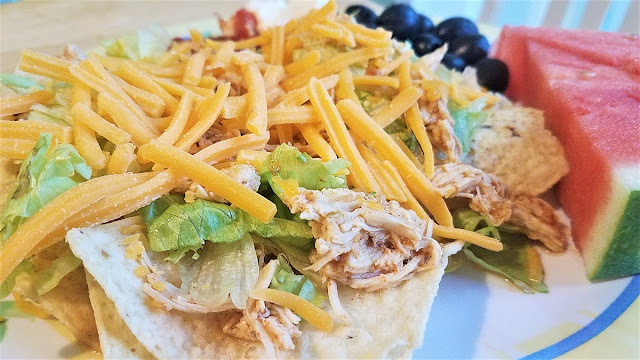 While the chicken is coming up to temperature, you can run around and chop some lettuce (for taco salads), grab some sides like chips, shredded cheese, olives, chips, and salsa, or taco shells for the kids. After the 15 minute timer goes off, let it sit for about 5 more minutes (wait time optional, if you're in a rush) then release the steam valve and pop that baby open as soon as you are ready. 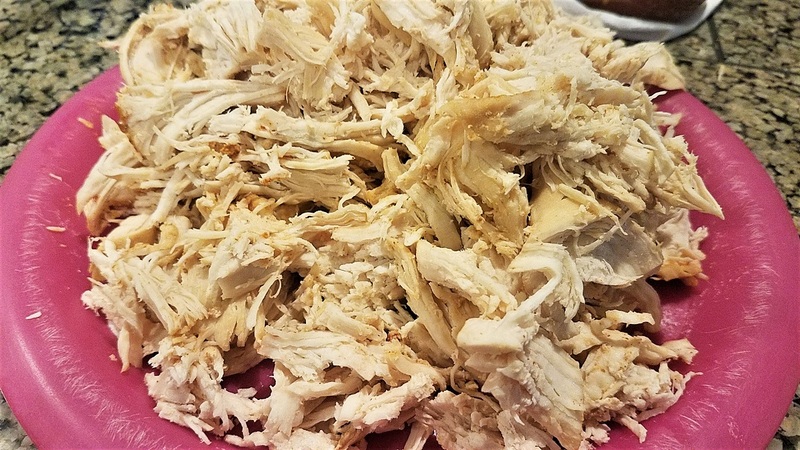 Take the chicken out of the pot and shred on a plate with two forks or a knife and a fork, depending on how you like your chicken chunks. 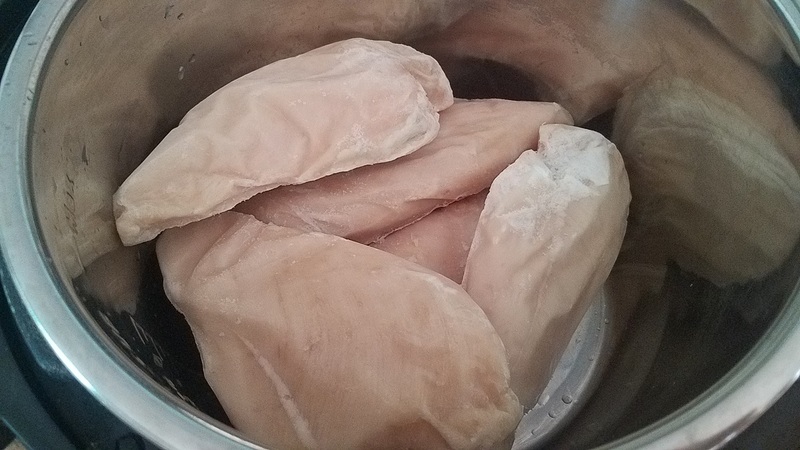 I make sure at this time to also remove any fat or veins, or anything unappetizing so it's just chicken. I also take a peek a the liquid back in the pot and skim off any unmentionables. 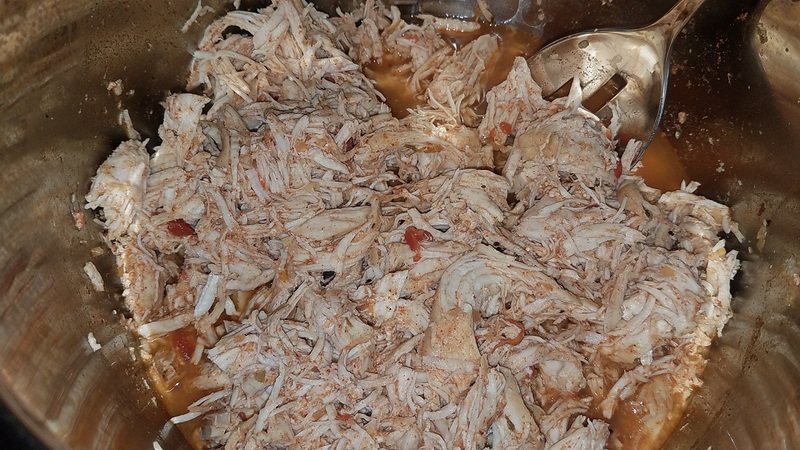 Place the shredded chicken back in the sauce and stir. See if it needs anymore seasoning and then you are good to go! I use a slotted spoon to scoop the meat out of the liquid and serve. 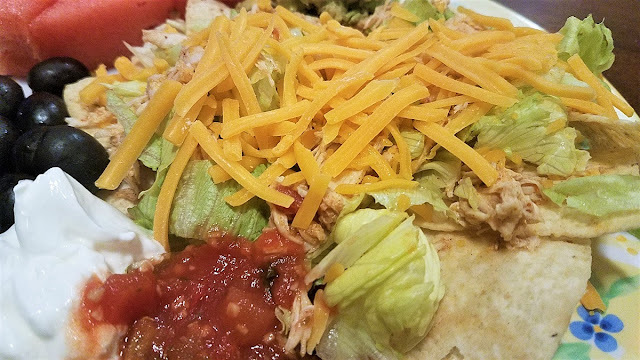 After that, just scoop some into a taco shell, plop on some shredded lettuce for a taco salad, and stack your favorite toppings on top. An easy meal and a tasty one too. My kids used to only eat ground beef tacos, now we've expanded their horizons. 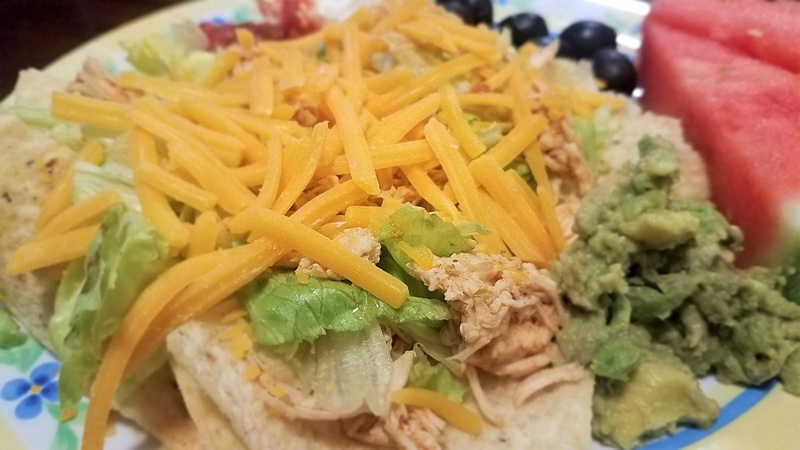 It's great the next day with left overs too, or bring some to work for lunch with a "taco salad kit" and make your co-workers jealous. My hubby loves doing that. 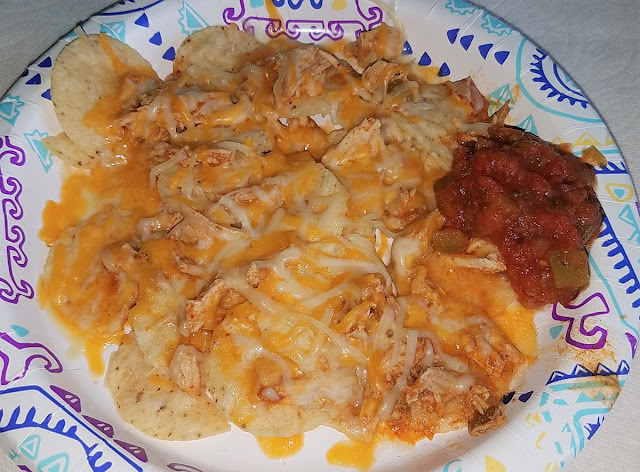 He'll send me pics profusely thanking me for "Taco Salad 2.0"
My daughter made chicken and cheese nachos for lunch the next day on her own, so that worked out well. It's the gift that keeps on giving. This quick journey from completely unplanned, sad, and frozen, to fast, tasty, and fabulous makes the whole family happy! 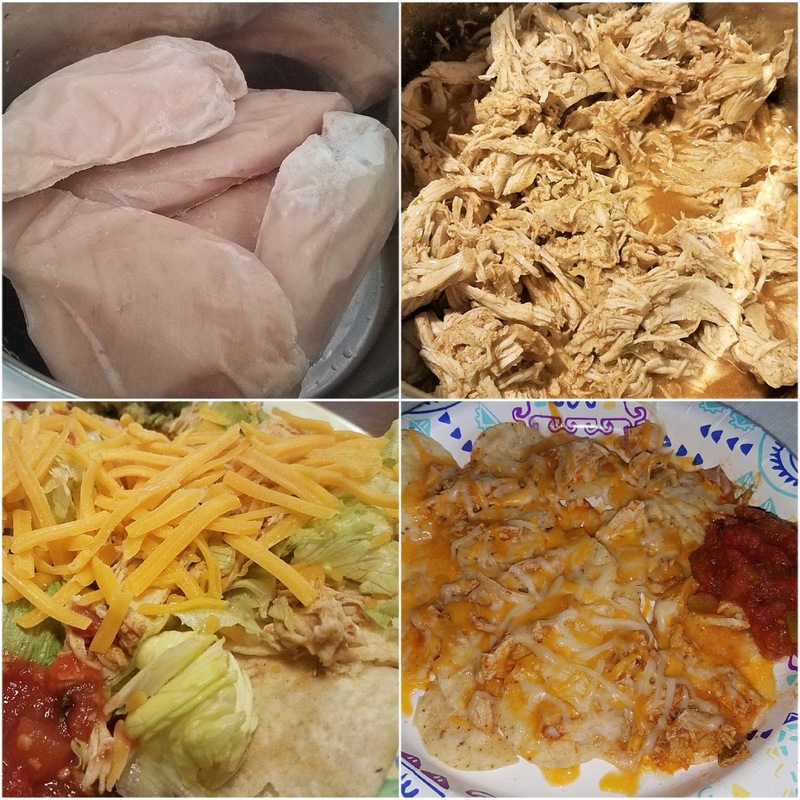 While at the same time making YOU feel like a hero because you literally pulled this dinner out of thin air (making you seem far more reliable than you actually are and pretty much all around awesome). Thanks Instant Pot! Jenn, "..making you seem far more reliable than you actually are..." LMBO!!!! ;) Will definitely try this recipe!